Young Living’s Inner Defense reinforces systemic defenses, creates unfriendly terrain for yeast/fungus, promotes healthy respiratory function, and contains potent essential oils like oregano, thyme, and Thieves oil blend which is rich in thymol, carvacrol, and eugenol for immune support. The liquid softgels dissolve quickly for maximum results. Softgel capsule has been reformulated with fish gelatin to remove the need for carrageenan and beeswax used in the porcine gelatin based softgel. 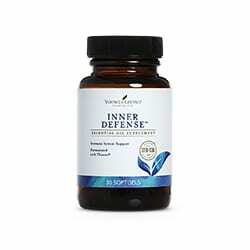 Inner Defense softgels reinforce systemic defenses. This creates unfriendly terrain for yeast and fungus, promotes healthy respiratory function. Inner Defense soft gels contain potent essential oils like oregano, thyme, and Thieves® which are rich in thymol, carvacrol, and eugenol for immune support. The liquid softgels dissolve quickly for maximum results. Why Do You Need Inner Defense Supplements? In today’s toxic environment, it can be difficult to maintain healthy immune function. With constant exposure to harmful germs and bacteria, poor diet, and lack of sleep, body system stress can negatively affect physical and emotional health. Inner Defense contains a wide variety of powerful essential oils like oregano, thyme, and Young Living’s proprietary Thieves essential oil blend. What Makes Inner Defense Unique? Easy-to-swallow, liquid soft-gels dissolve quickly in the stomach for maximum results. Who Should Use Inner Defense? Oregano oil is rich in the phenolic of carvacrol, which is known to support well-being when the body is distressed. Thyme oil is a rich source of the phenol called thymol. Thymol is a substance known to create an unfriendly environment for yeast and fungus. * It has been used as a purifying agent in the dental industry for many years. Cinnamon bark oil is very high in cinnamaldehyde, a very powerful cleansing compound. Ahmad, et al., “Antimicrobial activity of clove oil and its potential in the treatment of vaginal candidiasis,” J Drug Target. 2005; 13(10):555–561. H. G. Meeker, et al., “Antibacterial action of eugenol, thyme oil, and related essential oils used in dentistry,” Compendium. 1988; 9(1):32, 34–5, 38 passim. Didry et al., “Activity of thymol, carvacrol, cinnamaldehyde, and eugenol on oral bacteria. Pharm Acta Helv. 1994; 69(1):25–28. G. Q. Zheng, et al., “Sesquiterpenes from clove (Eugenia caryophyllata) as potential anticarcinogenic agents,” J Nat Prod. 1992; 55(7):999–1003. Youdim, et al. “Dietary supplementation of thyme (Thymus vulgaris L.) essential oil during the lifetime of the rat: its effects on the antioxidant status in liver, kidney, and heart tissues.” Mech Ageing Dev. 1999; 109(3):163–175. Take 1 capsule daily in a.m. or take 1 capsule 3-5 times daily when stressed. For best results, use Life 9™ probiotic 8 hours later. Keep out of reach of children. If pregnant, nursing, taking medication, or have a medical condition, consult a healthcare practitioner prior to use. Keep in a cool, dark place. Do not expose to excessive heat or direct sunlight.